Central Utah Water Conservancy District » What does a water treatment plant do? What does a water treatment plant do? You probably know about water treatment plants. You may have driven or walked past one in your home town. But have you ever wondered what it does? What does a water treatment plant take out of the water before it gets to the tap in your home? When it comes to water for drinking, it’s what’s not in it that’s important. The sources of our drinking water in Utah are rivers and reservoirs — natural bodies of water, habitats for fish, birds, mammals, insects and bacteria. They’re also receptacles of debris after storms, and run-off from farms and ranches. And, unfortunately, from industrial processes, as well. A water treatment plant has the job of removing everything we don’t want in our drinking water. Water has always been indispensable. We drink it, wash with it, give it to our animals, plants and garden, and use increasing amounts in a range of industries. A water treatment plant puts natural processes to work to remove harmful or unhealthy materials to make water safe to use and drink. 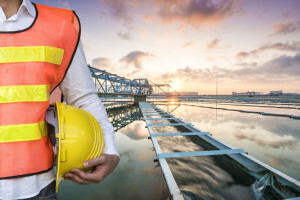 Water treatment plants also treat wastewater — the water that goes down the drains, so that it can be reused or returned to the natural water cycle, without harming the environment. Most water treatment plants have two stages: primary and secondary. The primary stage removes large solid objects from the water. A screen keeps large floating objects from getting into the water supply: logs and sticks, rags, garbage or other debris that can be floating or suspended in the water. From there, the untreated water flows into a large tank or chamber where grit, sand and other solids still suspended in the water can settle to the bottom. To speed up this process, chemicals called coagulants are added to the water. They cause the solids, such as clay or silt, to stick together and sink. The cleaner water flows out from the top, over a wall called a weir. The water will still contain things we don’t want in it: organic solids from waste. In the secondary stage, the water is filtered through layers of sand of increasing fineness. Rapid sand filters are the most common form of secondary filtering. Water can filter down, or sometimes up, through layers of sand of different coarseness. Often a layer of activated carbon is the first. The resulting water is clear, but it still contains bacteria that may be harmful. Different water treatment plants use different processes to disinfect the water, killing the bacteria. Chlorine is used commonly, similar to chlorine in a swimming pool. One of the main advantages of this method is that the chlorine remains in the resulting drinking water, killing any pathogens that may get into the water distribution system. The main disadvantage of chlorination is that it affects the taste of the water. It can also react with certain natural organic compounds in the water to form potentially harmful, sometime carcinogenic compounds. Chlorine is also ineffective against some pathogens that can be present in water. Every municipality in the U.S. has strict guidelines on the concentration of chlorine in drinking water. Another common method is ultraviolet light. UV light does not kill pathogens, but it prevents them from reproducing, and therefore renders them harmless. However, this does not prevent pathogens from entering the water system from another source between treatment and delivery. Ozone disinfection works by bubbling ozone gas through the water. Ozone disinfection produces fewer harmful byproducts than chlorination and leaves no residual disinfectant in the drinking water. From logs, rags and garbage, to grit, sand, bacteria and dissolved metals, the water treatment plant in Park City, Utah protects the health of our residents and community, while ensuring there is plenty of safe water in our state for people, agriculture and industry.